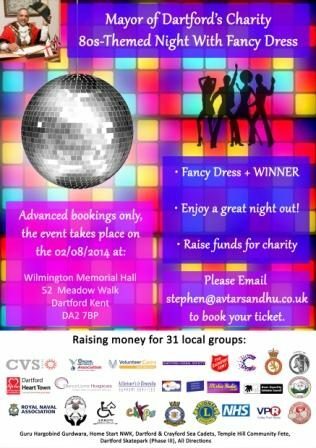 Mayor of Dartford Avtar Sandhu MBE is organising an 80s disco night on the second of August to help raise Mayor of Dartford Fundraiser funds for his 31 chosen groups and organisations. The 80s night, which will be taking part at the Wilmington Memorial Hall, will feature a fancy dress and a reward for the best costume! This will be the Mayor's third event, the curry night having been a huge success and encouraging the Mayor to push forward in his efforts to raise funds for his charities. The groups that the funds will be going to includes groups based wholly in the local area, such as Miskin Radio and the Arrow Riding Centre as well as the Dartford segments of many larger groups. There are many more in addition to these groups, and so if you would like to help support them while ensuring a great night out for yourself and anyone else that may be coming with you, please feel free to get in touch with a member of the Mayor's team, who will be able to book you a place at your event.